يقع فندق Paradise Isles Apartments، المصمم ليناسب كل الضيوف سواء كانوا من رجال الأعمال أو السياح، في مكان ممتاز في أحد أكثر المناطق تفضيلاً في هذه المنطقة. يحظى هذا الفندق ذو 4 نجمات بمكان ممتاز يسمح بالوصول إلى المعالم السياحية الأكبر في المدينة، فهو يبعد مسافة 0.5 Km عن صخب المدينة. يضفي محيط الفندق اللطيف وقربه من أكثر المعالم السياحية جذبًا سحرًا خاصًا على هذا الفندق. يقدم Paradise Isles Apartments خدمات لا غبار عليها وكل أشكال اللياقة وحسن الضيافة اللازمة لإسعاد ضيوفه. إن واي فاي مجاني في جميع الغرف, تخزين الأمتعة, واي فاي في المناطق العامة, صف السيارات, مرافق للشواء هي جزء فقط من الخدمات التي تميز Paradise Isles Apartments عن باقي الفنادق في المدينة. استمتع بوسائل الراحة الراقية في الغرف أثناء إقامتك هنا. بعض الغرف تتضمن تلفزيون بشاشة مسطحة, اتصال لاسلكي بشبكة الإنترنت (مجاني), مكيف هواء, تدفئة, شرفة/ تراس لمساعدتك على استعادة طاقتك بعد يوم طويل. سواء كنت من محبي الرياضة أو كنت تتطلع لتفريغ عناء نهار صعب، ستجد خدمات ذات مستوى عالي بانتظارك كمثل حوض استحمام ساخن, حمام سباحة خارجي, سبا, حديقة. إن Paradise Isles Apartments هو مكان مثالي للمسافرين الذين يتطلعون إلى الراحة والاستجمام في المدينة. They gave me a horrid room on the lower floor with no view. The shower head was broken in the bathroom . It was so depressing inside the apartment i left a day early as they refused to move me into a different room. I highly recommend anyone that u avoid the back rooms on the lower floor. Staff is super friendly and very helpful. The apartment was exactly as in the pics and offer a lot space and everything u need! Surfers is only a few steps away and u r right at the beach! I enjoyed every single day! Stayed 8 nights. Great shower. Aircon in main room only, with fan in bedroom. Would have been nice to be able to cool bedroom a little more. All other facilities excellent and good value for money. Staff very friendly and helpful. Stay was very pleasant. Nice room , kitchen , spacious bedroom and bathroom. With the pool and Jacuzzi , it was nice staying in a peaceful locality.The receptionists were very approachable. Definitely recommendable. It was good. Clean, location was good.. Love the laundry facilities and the free parking especially.. Below are the list of items to be improved to make a perfect one 1) Security was good but it would be better if it is automated like cards and not using key.. Must be 2 ways, currently it is 1 way.. when u close the door, u cant go out and have to walk the other way. 2) Apartment security can be improved. Feel slightly unsafe without the door ledge. 3) Cooking facilities can be improved by having non-stick pots and pans. Objective to stay in an apartment is to to be able to whip a good meal for your loved ones.. The current pans and pots are not helping much. Overall, it is value for money and I will still recommend to my family and friends..
Had a great stay! 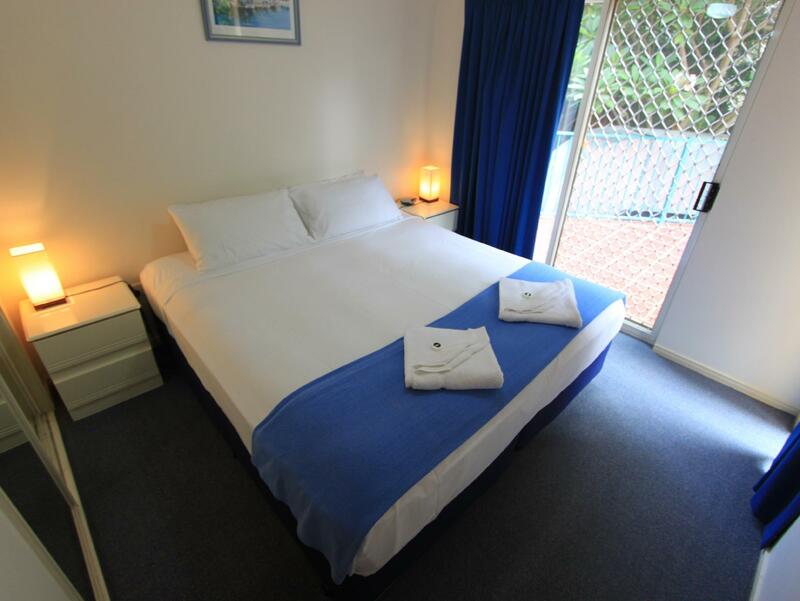 Clean, quiet and relaxed area, nice pool and jacuzzi, friendly ladies working in the building. Only comment is that the furniture is a bit outdated but I had a feeling they were busy remodeling some rooms. Other than that No comment. Would visit again in a heartbeat. No complaints at all for facilities. Everything we needed for our 5-day stay was all available within the apartment - DVD player, Foxtel, cooking facilities, washing facilities, etc. Air con in living room, ceiling fan in room. Works perfect for us as we prefer to return to air con apartment but sleep in non air-con room. No lifts in hotel though, so it was quite a hassle for us to carry our heavy luggage up and down three storeys. 15 - 20 min walk to Surfers beach hence we thought the location was not too ideal. Perfect for drivers though since estate is very quiet and has a allocated underground carpark for each unit. 5-min walk away from eateries and a mini mart serving Chevron Island. We had a great time ! The position of the hotel is perfect, every day we walked into surfers paradise to check out the shops and see the beach. The hotel is also a short drive from the theme parks and the big outlet shopping centre. We were after a quiet getaway and we got exactly that (even though we went away during schoolies period !!) beautiful restaurants near by too, check out the 'curry munched' Indian restaurant down the road !! The room was great, free wifi (little bit temperamental but still worked), Foxtel (the storm cut it out on the final night but we were able to download a movie to watch instead), air conditioning (thank god) and spa and swimming pool. There was nothing more we could have really asked for ! We even got the room at the top corner of the hotel with city views and a huge balcony ! Very impressed with the service, the lady on reception was lovely and very helpful ! 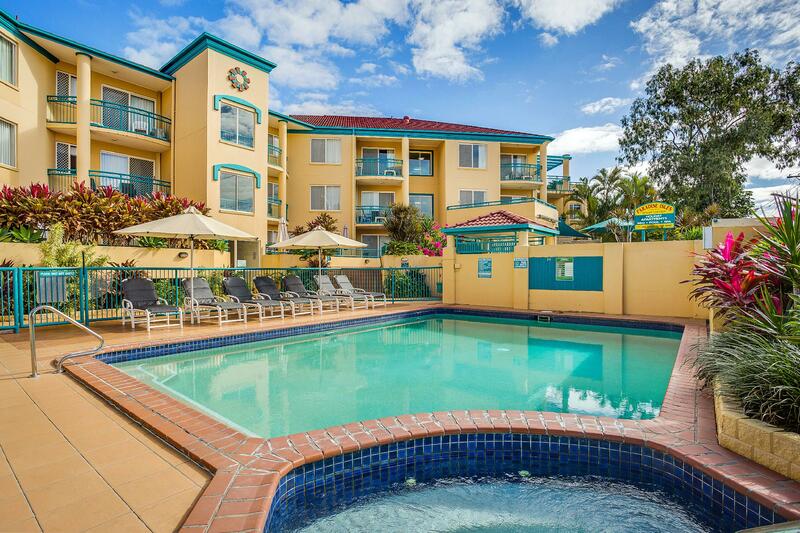 Definitely recommend this hotel, and even though I hadn't intended to return to the Gold Coast to holiday any time soon, I now want to go back because it was such a great experience !! Enjoyed the pool and spa. Air conditioning in the living room was useful. Location was close enough to Surfers, but its not city central. Kitchen was well equipped and tidy, and having the laundry tucked away in the bathroom was useful. Staff were friendly. We will definitely stay here again. The price and location were excellent, we had a top floor apartment with views across Surfers and the heated spa was a real treat after a day on our feet. Loved our stay, can't wait to return! It was great - the front desk service was great, late check-in was handled beautifully. Rooms were spacious and could technically fit up to 4 people. Wifi was reliable and fast. Generally all-round good choice if you're looking for an accom around sufers' paradise. (although it's about 10-15 mins walk to the center of SP) But still well-worth the price. aircon doesn’t work ( no power ) at the first night got there told staff next day to fix it , the stove got rusty , internet inside the room 33 doesn’t work as modem doesn’t have signal, told Asian guy staff to fix it but still doesn’t work, he said maybe something wrong with my iPhone or iPad, long distance walk to surfer paradise, the indoor clothes dryer the one hang the clothes got rust , a tiny package of fresh cream left inside the fridge for the guest to make coffee was best before 19/7/18 , as we check in on 19/7/18 at 10pm told Asian staff and he said the cleaner should check it. Worked at Schoolies for the week, beautiful quite place to come back to after work. Recommend to all 150%. Thank you so much,. Great location very close to everything. Great value for money. Cleanliness, very comfortable and great location. Terrible service... arrived just (5-10 minutes) before 5pm to find the office closed. Following the instructions, I rang the number provided... no answer. Finally got onto someone who answered the emergency number. They instructed me on how to get into the safe to get the key to my room. The cleaner was at my door at 10.05am on check out day and I received a phone call from reception around the same time asking when I would be leaving.